My love affair with carrot cake has been a life long journey. It’s no secret that I like cakes and will take every opportunity to bake one but come February I know exactly what cake I am going to make. Carrot Cake. I love it so much that I bake one for my birthday every year. Sound sad? In a way it is but I really enjoy baking my own cake. When we lived in Australia I relaxed a bit and found a bakery that could make a delicious carrot cake so I splurged for a couple of years and bought one. I remember one of those years standing in the heat outside my house, balancing the cake while I unlocked the front door and ooops! there went the cake box upside down on the front step. Did I bin it? Heck no! We ate smashed carrot cake for my birthday that night and it was just fine. I’ve shared many a story with you about my grandmas and how I learned to cook by their sides but I haven’t shared the story of our wedding cake with you. My Grandma L; the one who loved butter and who took every opportunity to bake a cake, also made a glorious carrot cake. In fact while planning our wedding my first choice in wedding cakes was not the preserved fruit nightmare (think Christmas cake) that was traditional back then but a delicious carrot cake. And there was no one else that could make it better than my grandma. Of course, she was no pastry chef and we just had a simple sheet carrot cake to serve our guests but having my 83 year old grandma make our cake was special indeed. Grandma has been gone now for almost three years. I still miss her everyday but I can feel her with me in memory, especially when I am baking. So grandma, this carrot cake is for you! 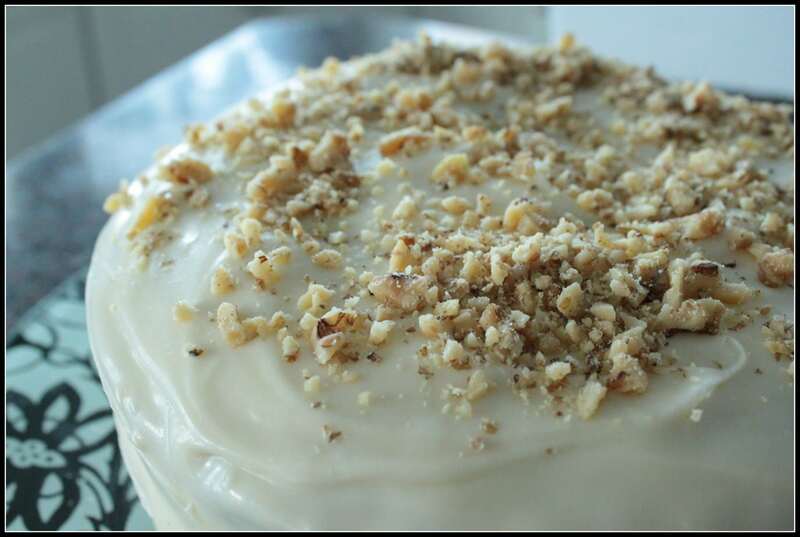 What is a carrot cake without some nuts? Walnuts were grandma’s favourite. With all those nuts and carrots in there how can this cake not be good for you? Now, I have a special request. 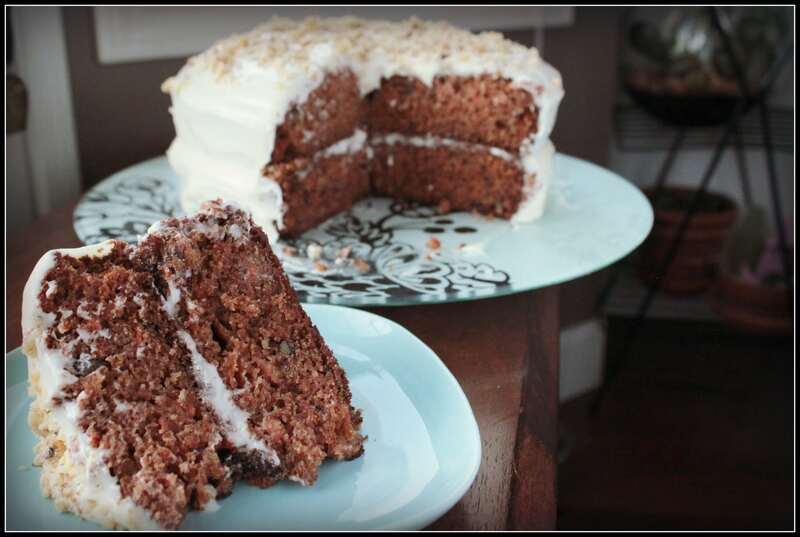 I have been in love with carrot cake my whole life and that includes chocolate carrot cake. In university I would steal over to Alexander’s Restaurant for a slice now and then. Whenever we are traveling through Saskatoon I make sure and stop in for a slice and every time I have asked for the recipe I’ve been denied! If anyone out there knows the recipe for Alexander’s Chocolate Carrot Cake or has one that is outstanding…please let me know! The recipe I used was not my grandma’s recipe but one that I found on Chow. It is nice and moist without being too oily and the spices are just right. Mix together in a bowl together flour,baking soda, baking powder, salt, cinnamon and nutmeg. In a bigger bowl, whisk together eggs, oil, sugars, and vanilla for about minute or so. Add the dry ingredients to the wet mixture and mix for about 2 minutes more. Add the grated carrots. Then add nuts and raisins if desired. Pour batter in prepared cake pans and bake for approx. 45 to 50 minutes. Test for doneness by inserting a skewer, it should be dry when taken out. Cool then fill and frost with cream cheese frosting. 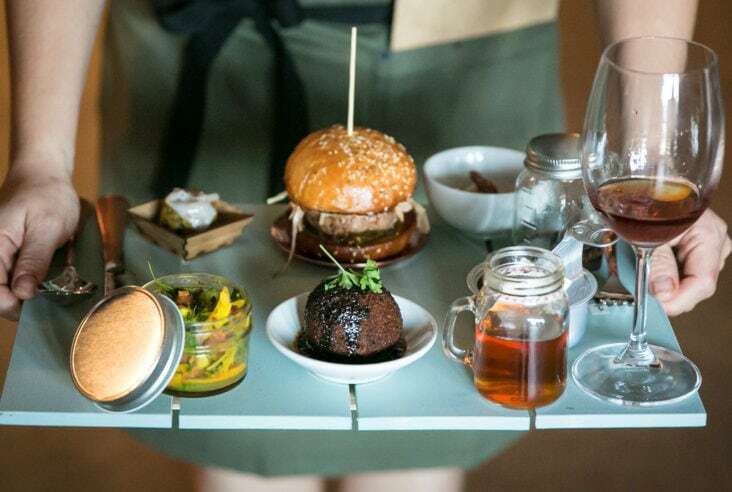 Garnish with more nuts. 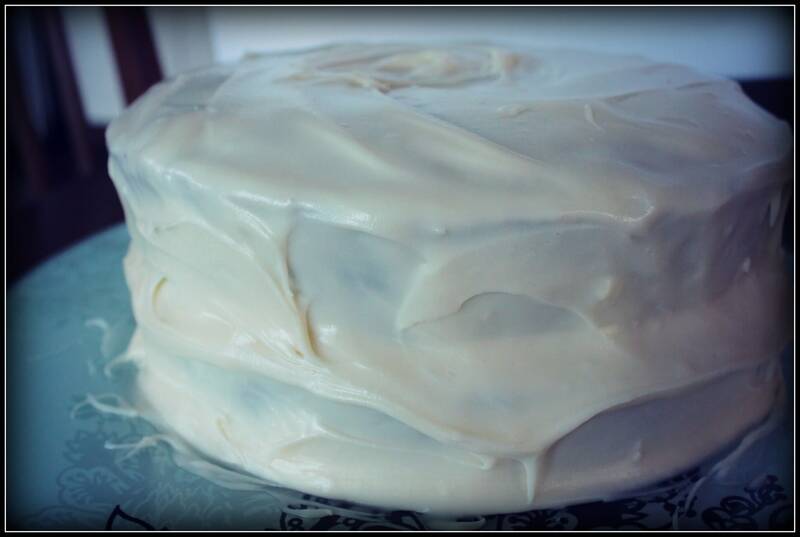 To make the cream cheese frosting: a bowl beat together cream cheese and butter until creamy. Add in icing sugar and beat for a minute. Add vanilla. Scrape down the sides of the bowl and beat for another minute. 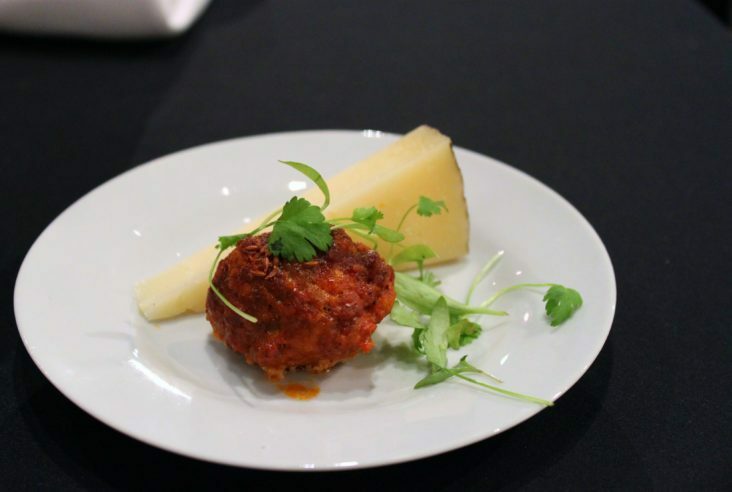 I am writing this post as part of my contribution towards the Canadian Food Experience Project that began in June 2014, in which a group of Canadian Food Bloggers and writers share collective stories through our regional food experiences in the hope to bring global clarity to our Canadian culinary identity. Huge thanks go to Valerie Lugonja (A Canadian Foodie) spearheading this project and for her dedication. Thanks Valerie! Man, I used to love a good carrot cake. I like to live in denial of ownership of a sweet tooth now though and hence I shall not be eating carrot cake any time soon… well maybe just a little taste… especially if it’s for nan. I saw “Canadian” and couldn’t help stopping in. :). Regarding your query, why don’t you experiment? Sounds like you are a great cook. Why not try adding chocolate to your own carrot cake recipe? Alexanders uses milk chocolate bars in their chocolate cake, so I suspect they just add some of this to their carrot cake. I, of course, would try to make my own adaptation a little healthier by using dark chocolate and or cocoa, some whole wheat flour, and less sugar. But that’s just how I like things and I’m sure Alexanders does it differently. Go for it! 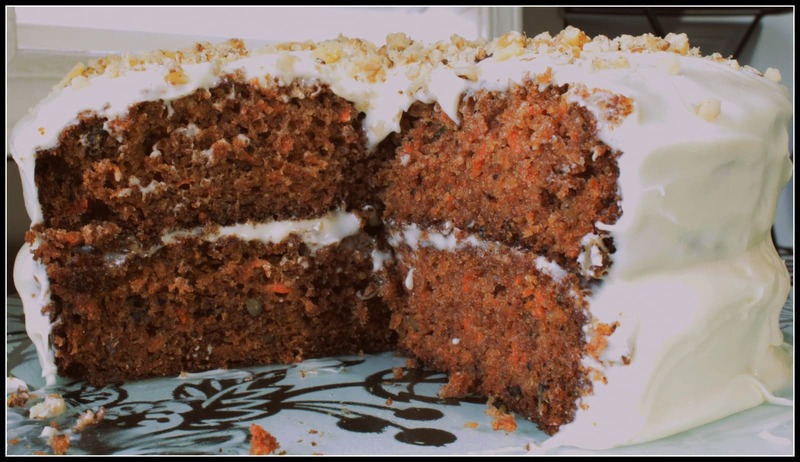 Carrot cake is one of my favourite non-chocolate desserts, this recipe looks great! thanks! yes I really like this one. I would have liked to add raisins but my kids are dead set against them.